You can download Coke Studio Season 4 - Mix High Quality Mp3 Songs. 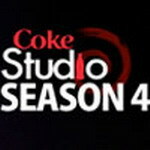 Coke Studio Season 4 was released by Various Artist in year 2011. There are about 20 mp3 songs in album Coke Studio Seaon 4. Coke Studio is a Pakistani television series featuring live music performances. Coke Studio is produced by Rohail Hyatt and his wife Umber Hyatt. Featured artists on each episode are backed by a house band and guest artists. Scheduled broadcast dates are : Episode One on May 22,2011, Episode Two On 05th June , 2011, Episode Three On 19th June , 2011, Episode Four On 4th July , 2011.